Ron Burt’s concept of “structural holes” (1992) argued that people who connect different realms gain comparative advantages through their brokerage. Burt was talking about individual brokerage. But, what about the realms they connect? Do they do better or worse when the holes between them get bridged? In the mid-1990s, both CITASA and ICS were doing well, but had yet to realize their potential. CITASA had bootstrapped itself up from 99 members to over 300, thanks to great membership work by a small group of young scholars, riding the large wave of internet enthusiasm (Earl, 2015): Keith Hampton, Eszter Hargittai, and Anabel Quan-Haase loom large in my memory. I was involved with this, first as membership head of CITASA, and then as section chair for 2004-2006 and council member 2006-2008. Concomitantly, ICS had become a leading journal in studying the internet and other digital stuff, but it had a United Kingdom base: That’s probably why ICS editors Brian Loader and William Dutton asked me to become its North American Editor in 2003. Here is where serendipity meets network brokerage. When I was spending a week in the beautiful Yorkshire Dales, I took a short train ride to the city of York to meet ICS Editor Brian Loader in the L‘antica Locanda restaurant in The Shambles. We sat in this olde timber-framed house in an overhanging window from which offal used to be poured (Figure 1). It was not a shambolic meeting. As we sipped wine, Brian and I got to the point. We talked about how ICS would like more articles and had the space for them with its imminent expansion from six to eight issues per year. At the same time, CITASA had considered that the time was not right to start its own journal devoted to the sociology of ICTs, because: 1) journals take up a lot of time and money to run, even when online only; 2) starting one would require a laborious, problematic search for a publisher; 3) starting a section journal requires American Sociological Association approval, as no section is a legal entity and cannot publish on its own. I had gone through this when starting the City & Community journal for the Community and Urban Sociology section, and I knew what a lengthy and problematic process it was. Need met need. The solution was simple. CITASA would prepare one issue a year, based on papers presented the previous August at the American Sociological Association annual conference. Leading CITASA members would edit, working hard to get the best papers from the conference—not necessarily presented at the CITASA section meetings.3 To show off both CITASA and ICS, each would work hard to get the issue out before the next ASA annual meeting. ICS got to fill one of its two expansion issues, and CITASA had a publishing home. The solution was quickly implemented, as both the ICS board and the CITASA Council and Membership meeting—led by chair Jim Witte and incoming chair Keith Hampton—easily agreed. It was a win-win for both CITASA and ICS. My notes show a summarizing memo of March 2007 to CITASA members. Here are parts of that memo, with my 2015 comments in italics. 1. Once a year, ICS would contain a special section of CITASA papers, drawn from CITASA sessions, other CITASA activities (such as mini-conferences), plus other germane papers from the ASA annual meeting. In practice, these have all been from the most recent ASA annual meeting, including the CITASA section meeting but also including CITASAish work present outside of CITASA sessions at the ASA meeting. 2. The issue would comprise 5 or so articles in a special section, but if the quality were sufficient we could go to 7 articles (which would comprise a full issue). The ICS editor and the CITASA editors would have the final word about the number of articles in a particular year. There have always been enough papers to fill an entire issue. In 2009, there were so many good articles, that three on social movements spilled over into another issue. 3. The special section/issue would have an introductory editorial from the CITASA editors. Yup, and they are quite good. 4. The papers would be peer reviewed. All papers are rigorously peer-reviewed under tight deadlines. A commitment to the CITASA special issue and support by the community has allowed CITASA/ICS to get the issue out in the spring or early summer before the next ASA meeting. This allows CITASA and ICS to display the just-published issue proudly and publicly at the ASA meeting, thereby demonstrating to potential new contributors the efficacy of the process. 5. The actual administration of refereeing, proofing, etc. would be taken care of by the ICS journal office (but who would undertake to use referees suggested by the CITASA editors). In practice, the refereeing is all done by CITASA, not ICS. Soon after the meetings, the editors of the next CITASA/ICS issue get letters out requesting submission of germane papers for editorial consideration. The editors then arrange for refereeing. The final mechanics of getting the issue proofed and out is done by ICS, using their standard ScholarOne system. Brian Loader has continued as ICS’ intrepid and supportive editor. Sarah Shrive-Morrison has been its the efficient and responsive managing editor for a number of years. 6. CITASA members would also be free to submit papers to ICS independently, that is under the same submission rules as operate now. That is, the five-paper rule would be a minimum, and not a maximum, of papers that ICS could publish in a year from CITASA members. CITASA members not only fill the special issue, they publish other papers to ICS. 7. CITASA members are encouraged, but not required, to submit their papers to this special issue. This would be an additional opportunity available to CITASA members, and not a requirement: CITASA members would continue to be free to seek publication wherever they want. For example, the “Stellar Seven” finalists in CITASA’s Best Paper awards competition come from a number of journals. An annual Emerald Studies in Media and Communications started in 2013 devoted to CITASA-like articles, with its editors graciously agreeing to wait until the forthcoming ICS issue has made its offers and decisions. In some cases, the authors of papers presented at the ASA meetings already have journal acceptances in hand and have to decline when CITASA/ICS editors express interest in their papers. 8. CITASA would have at least one person on the ICS editorial board who among other things would serve as liaison. Normally this would be the CITASA member serving as editor. This has not been strictly followed, but I have been on the board since the start of the series and am an informal liaison. Other CITASA members now on the board include Mary Chayko, Keith Hampton, Eszter Hargittai, James Katz, David Lyon, and Gustavo Mesch. Many have won CITASA awards. 9. Both sides agreed to maintain the relationship for a minimum of five years. Nearly a decade later, it is still going strong. To the victor, belongs the work. I agreed to be a co-editor of the first issue, together with CITASA chair Keith Hampton. Keith and I had often worked together. We were both efficient and trusted each other. To obtain papers for the first CITASA/ICS issue, we contacted the authors of 105 relevant papers in the ASA program. Twenty-three were submitted for consideration, and we used a two-stage refereeing process to select the seven papers that appear in the first 2008 issue. We set tight deadlines, and had quick turn-around. We argued, in our introductory article (Hampton & Wellman 2008) for the link between sociology and communication (see also Early 2015), and we pointed with pride to the doubling of membership in CITASA 2003-2008. The papers were “a nice combination of systematically coded content analysis—of Google search results and the New York Times website—survey analyses of specialized and national samples, in-depth interviewing and field observation” (Hampton and Wellman 2008: 416). Unlike recent issues, authors had not gotten around to scraping Facebook or Twitter. The lead article was by Jennifer Earl (now a recent CITASA chair) and Katrina Kimport (current secretary-treasurer). Other authors included Emily Thorson, Jeffrey Boase, Patricia Drentea, (recent chair) Shelia Cotten, (current Council member) Anabel Quan-Haase, Jessica Collins, Zeynep Tufekci, (future issue editor) Shanyang Zhao, and (past chair) David Elesh. The watchword for the 2009 issue was “diversity”. The articles had diverse objects of study; diverse theories (among them habitus and dependency); diverse locales with a majority of papers ranging far beyond North America; and diverse methods. The papers showed how embedded ICTs are in everyday life—at a time when pundits, pop book writers, and the media persisted in thinking of ICT use as separate from ordinary pursuits. The digital divide had become increasingly multifaceted with digital skills and use divides becoming apparent (Wellman and Nippert-Eng, 2009). After putting two issues to bed, it was time for other hands and voices to take over (see Table 1). I can say with absolute objectivity that the special issue tradition has thrived. Many editors have been authors in earlier CITASA issues. Many have chaired the section at about the same time their issue was being prepared. Each set of editors—there have always been two—has maintained diversity and quality. Most have provided valuable training by involving junior faculty and grad students in the process. What will happen in the near and medium future? 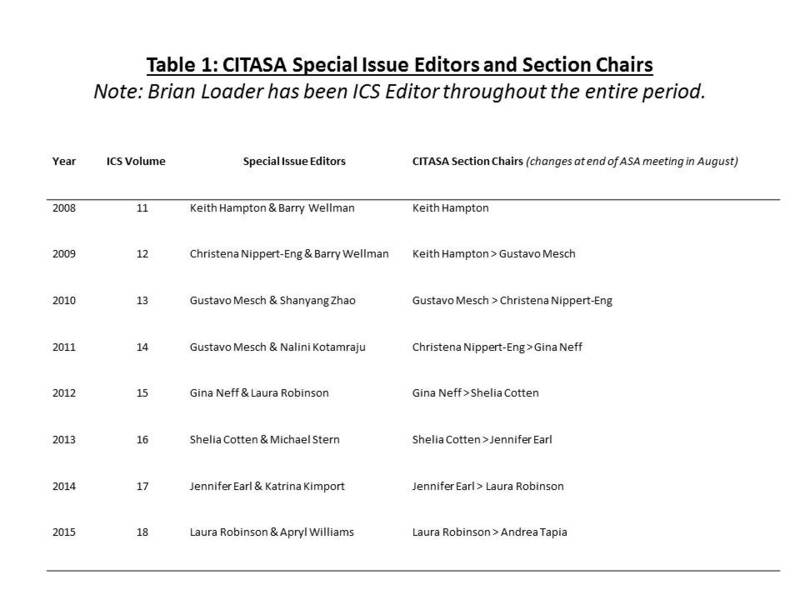 As I am both an ICS editor and member of the CITASA Council, I feel comfortable in saying both journal and section seem to be happy. ICS is now more widely read, with the majority of readers looking at it online. It has expanded from eight to twelve issues annually. ICS’ interdisciplinary scope goes well beyond sociology—including a number of special issues—and it has developed a strong international authorship and readership. The journal has recently appointed Hong Kong communication scientist Jack Qiu to become its Asian editor. Even with ICS’ multidisciplinarity, the 2013 Journal Citation Reports ranked it in the first quartile of sociology journals (32/138), with an impact factor of 1.283. CITASA has continued to grow in numbers and in the quality of its papers. It is running an annual pre-conference because the number of quality papers outnumbers the availability of germane ASA annual meeting sessions. ICS and CITASA have had a happy and productive relationship that should continue fruitfully in the foreseeable future. The structural hole has been well bridged. Burt, Ronald. 1992. Structural Holes. Chicago: University of Chicago Press. Earl, Jennifer. 2015. “CITASA: Intellectual Past and Future.” Information, Communication & Society 18, 5: 478-91 (May). Hampton, Keith and Barry Wellman, 2008. “Sociology and ICTs.” Information, Communication and Society, 11, 4: 445-48. Nippert-Eng, Christena and Barry Wellman, editors. 2010. Special ASA Communication and Information Technologies section on social movements on and offline, Information Communication & Society, 13, 3 (April). Rosten, Leo. 2001. The New Joys of Yiddish. Revised by Lawrence Bush. New York: Crown. Wellman, Barry and Christena Nippert-Eng. “Editorial Comment: Diversity.” Information, Communication and Society 12, 4 (June): 466-68. CITASA” is the Communications and Information Technology section of the American Sociological Association, while “ICS” is the Information, Communication & Society” journal. 3 ICS as the publisher of record retained final editorial rights, which it has never exercised. My thanks to Jenny Davis, William Dutton, Keith Hampton, Brian Loader, Chang Lin, Laura Robinson, Sarah Shrive-Morrison, Anabel Quan-Haase, and Beverly Wellman for their advice.